On Saturday 8th of September WILPF UK and GMDCND hosted a TPNW training day to develop participants’ lobbying and negotiation skills. Our aim was to give attendees the confidence to lobby their MPs to sign ICAN’s Parliamentary Pledge (a serious and binding agreement to work with Parliamentarians across the world so that all Governments sign up to the Nuclear Ban Treaty). 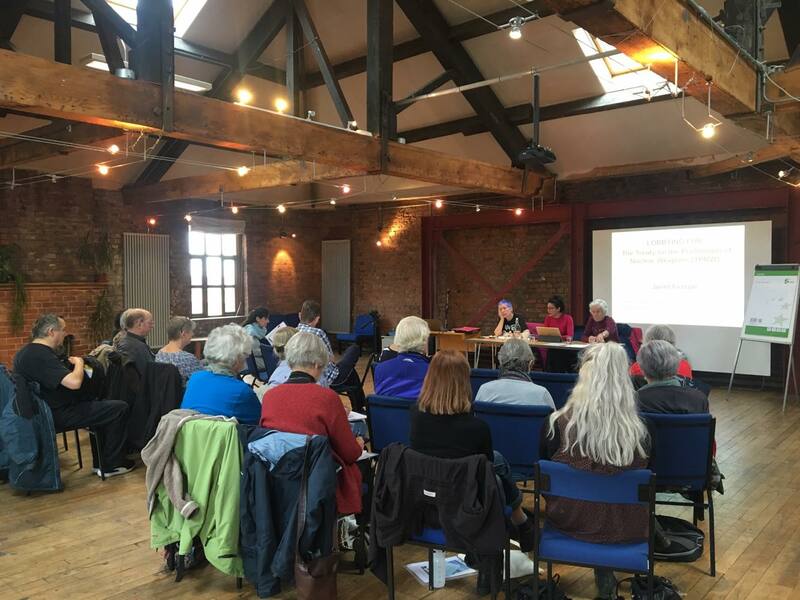 Hosted in Bridge5Mill, anti-nuclear campaigners came together to share their experience, expertise and advice on how to become an effective lobbyist. Sessions included an introduction to the background of the Treaty & how it relates to the UK context; common misconceptions about nuclear weapons and myth-busting techniques; and an interactive role-playing session. Janet Fenton (ICAN International Campaigner & Vice Chair Scottish CND) shed light on the how the rest of the UK can learn from the Scottish context, a country that has a measurable and concrete response to nuclear weapons. Taniel Yusef (International Board WILPF UK) stressed the importance of turning common arguments used to defend nuclear weapons (such as that of the economy and security) on their heads when engaging in conversations around the weapons. Lastly, Sean Morris (Mayors for Peace & NFLA) encouraged participants to engage with local councils as well as MPs and spoke about the value of towns and cities. One message from the day was particularly strong: the ability to civil society to enact change. The Nuclear Ban Treaty itself is a primary example of what can be achieved when citizens come together in solidarity and in pursuit of peace. The Lobby Training Day was an important reminder that we can all play a part in changing UK policy and making it the first nuclear-state to sign. WILPF UK will be focusing on gender and nuclear weapons this coming Autumn Seminar. Well done to everybody who made this event possible and thank you to WILPF INTERNATIONAL for providing the funding for this event.